There are many competing standards and protocols when it comes to instant messengers on the Internet, but one of the most convenient and comprehensive is Google Hangouts. Once known colloquially as Google Chat or GChat and evolving from what was once called Google Talk, the platform has expanded greatly and new features are being added all the time. Google has worked to improve the ease of use for Hangouts, helping to make the online messaging system more accessible to all users regardless of skill level or familiarity. As with most other services offered by Google, your account for Google Hangouts is effectively tied to one central Google account. You will use the same login and password that you would use for other Google services, like Google Calendar for appointments, YouTube for videos and Google+ for social networking. When you log into any of the associated Google services, you are also logging into the Google Hangouts system. While there is an extension for the Google Chrome browser that functions as a desktop application for Google Hangouts, this typically is not necessary. The Hangouts interface is pervasive across many Google sites, the most notable of which being Gmail. To start a Google Hangout chat session within Gmail, follow these steps. Log into your Google account at gmail.com. The Hangouts interface will automatically appear in the sidebar of the Gmail main screen with a list of friends and contacts. If the contact does not appear on the list, you can use the search field under your name in the Hangouts interface to find him or her. Click on the name of any contact to begin a chat session. Alternatively, when you hover over a contact's name, a pop-over appears where you can also find a button to initiate a Hangout. The Hangout chat window will appear docked to the lower-right corner of your browser window where you have Gmail open. If you would like to undock the chat window, click on the arrow pointed diagonally to the top-right to "pop-out" the window. The precursors to Google Hangouts were relatively simple, but Google has added many features over the course of its development. At the most basic level, Google Hangouts can be used for plain text-based conversations the same way as other instant messengers, like Facebook Chat or AIM. When you open a chat window with a contact, you can start typing within that window for your chat. In addition to plain text, website links can be inserted and these are clickable by the recipient. When a link to a YouTube video is sent, Hangouts will automatically convert this link into a small YouTube video player. Just as with many word processors, to bold or italicize text within a chat window, use CTRL+B and CTRL+I, respectively. Just to the left of the text entry area is a small smiley face. When clicked, this brings up multiple tabs of emoticons that can be sent. To participate in a group chat rather than a one-on-one conversation, use the icon in the top-left of the chat window that looks like a person with a 'plus' sign next to him. Click this to select the people you would like to add to the Hangout session. To share images in a Google Hangout, a web link can be inserted or you can upload an image that you have stored locally on your computer. Just to the right of the text entry area in a chat window is a greyed-out camera icon. When this is clicked, a pop-up window appears where an image file can be dragged. Alternatively, there is a button to select a photo from your computer for uploading. From this same window, there are additional tabs where photos can be selected from your existing Google+ account or to take a new photo using a connected webcam. Starting a video chat with Hangouts is just as easy as having a text chat. In the top left corner of the chat window, next to the icon to add people to the Hangout, is a button that looks like a camcorder. Clicking this will send a request to the recipient that you would like to start a video chat. Make sure that you have your webcam setup properly on your computer before taking this step. While a basic one-on-one video chat can be easily initiated within the Gmail chat interface, a group video chat is best accessed through the Google Hangouts page on Google+. The list of contacts still appears on the side, as it did within Gmail. The third tab next the top of the page is labeled as Video Hangouts. Click on this and then select "Start a video Hangout" via the provided button near the top-right. A new window where participants can be invited will open. 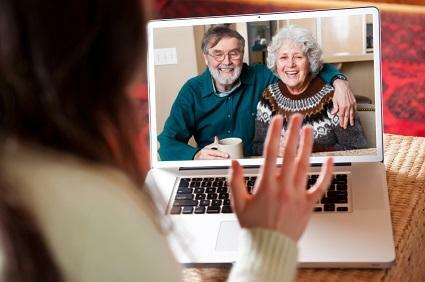 Similar to the individual video chat, an overlaid interface will also appear to turn your webcam on and off, as well as mute and unmute your microphone. Hovering over the Video Hangout window also brings up an additional toolbar on the left side where additional content can be shared, including screen sharing, YouTube video sharing, Google Effects and sharing documents and files from Google Drive. On the same Google Hangouts page on Google+, the second tab is labeled as Hangouts On Air. This is similar to the Video Hangout Party, except it is more akin to live streaming. You can share your video feed publicly as a live stream, and this broadcast can be shared. It can also be archived to your YouTube channel. Hangouts on Air can start immediately or they can be scheduled to start at a later date. The audience can also be selected, including a public share, as well as restricting to certain Google+ Circles or specific Google+ users. In addition to the interface that can be used on a laptop or desktop computer, there are also Google Hangouts apps available for both Android and iOS. The functionality is similar to the browser-based desktop counterpart, but it has been optimized for the smaller screen of mobile devices like smartphones and tablets. This includes support for image sharing, video chats and group chats, among other features. In the case of Android, the Hangouts app can also handle text messages, seamlessly switching between SMS and web-based Hangout chats. Google Hangouts is a comprehensive solution for communicating online, seamlessly integrating with your existing contacts and content through your Google account. It can be used simply as a text-based instant messenger, but it also allows for more robust features like group chats, public live streams, file sharing and more. Using Hangouts is much easier than you might think!